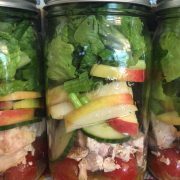 If you find it to be a challenge to eat healthy lunches, you need to start making mason jar salads! 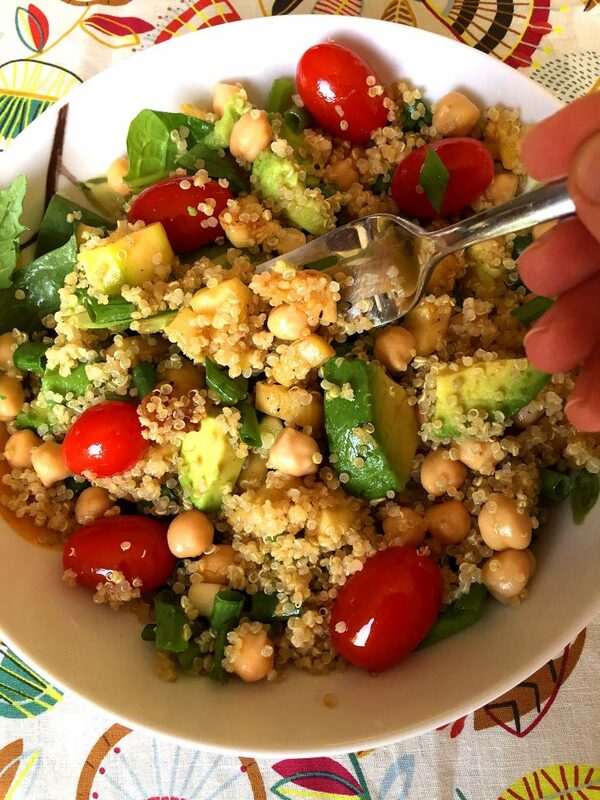 Eating healthy will be so easy when you have this amazing chickpea quinoa mason jar salad waiting for you in the fridge! 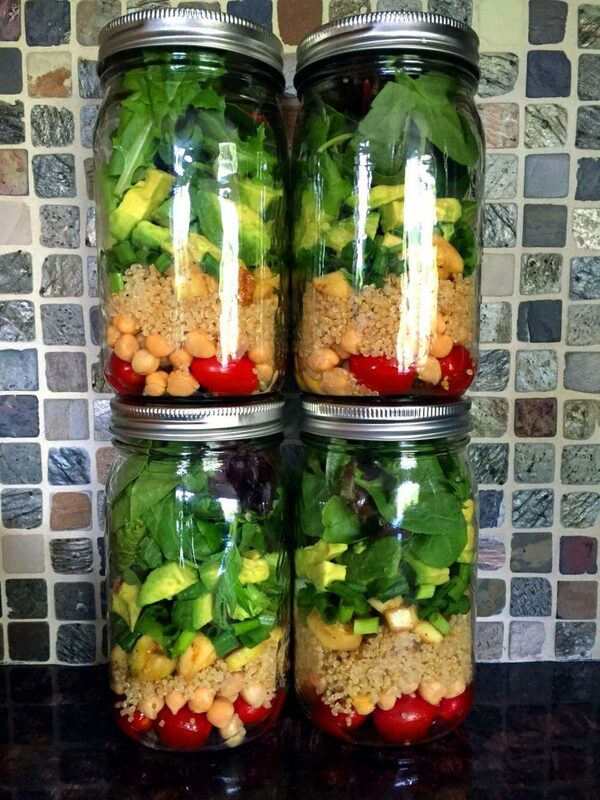 Grab a mason jar with a salad and your healthy quinoa lunch is here! Delicious! 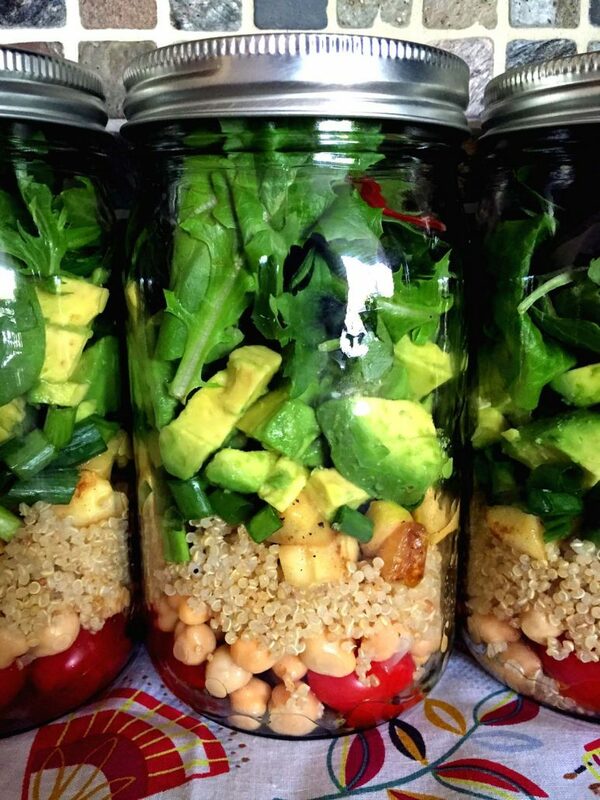 Beautiful layers of cherry tomatoes, chickpeas, quinoa, zucchini, green onion, avocado and lettuce are kept fresh in a mason jar, just waiting for you to eat them. 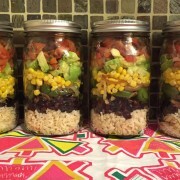 Glass mason jars are amazing in keeping salads fresh for up to 5 days. Believe it or not, the lettuce stays crisp and all ingredients taste so yummy! A note about avocado – when you have chopped avocado in any pre-made salads, the trick to keeping it from turning brown is tossing it with a generous amount of freshly squeezed lemon juice. The acid in lemon keeps the avocados bright green! This chickpea quinoa mason jar salad is vegan, but it’s super filling and will definitely keep you full until dinner. 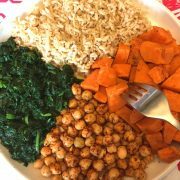 The protein comes from the chickpeas and quinoa itself – even though quinoa is a grain, it has high protein content and is really good for you! The key to successful mason jar salads is putting the dressing on the bottom and then layering them in the order listed in the recipe. Also, put as many lettuce leaves as you can to fill the jar to the max – the less air space remains, the better it is for helping it stay fresh. You can eat this quinoa mason jar salad either straight out of a jar (shake it upside down beforehand) or just invert it into a large plate. 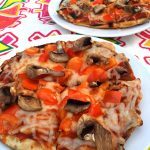 No matter which way you eat it, it’s so delicious and nutritious! 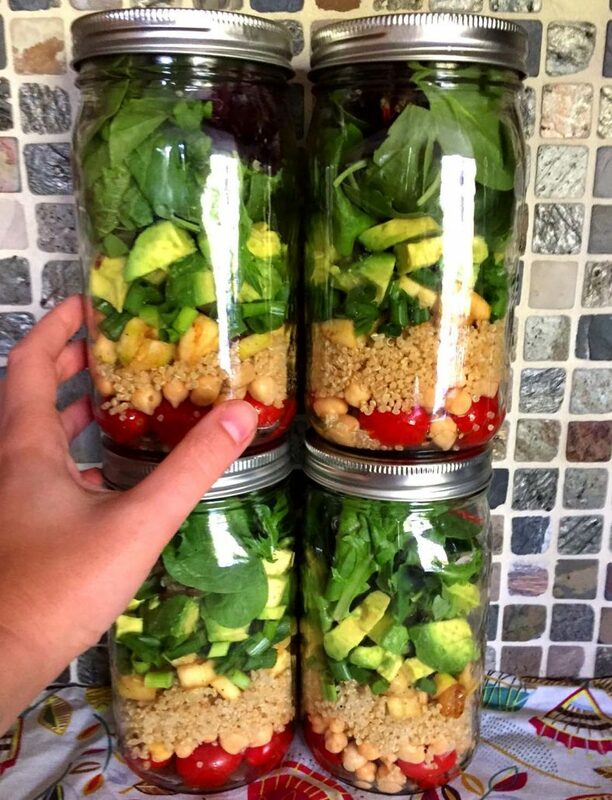 In addition to this yummy healthy chickpea quinoa mason jar salad, I have other amazing salad-in-a-jar recipes: chicken apple mason jar salad, Mexican burrito bowl mason jar salad, mango chicken mason jar salad and soba noodle mason jar salad. Now you’ll never run out of healthy lunch ideas 🙂 Enjoy! 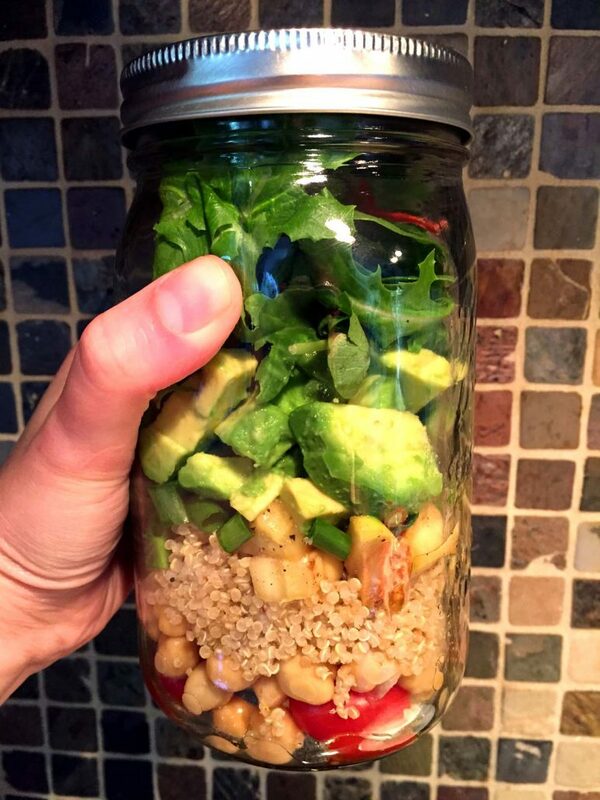 This chickpea quinoa mason jar salad is so fresh, delicious and filling! 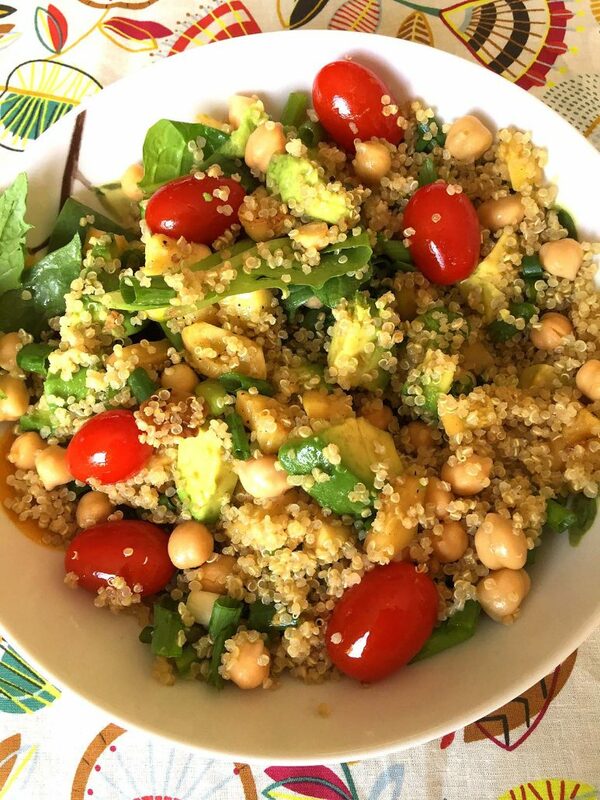 Chickpeas, cherry tomatoes, quinoa, green onions, avocado, zucchini and lettuce, with extra virgin olive oil and lemon juice - it just screams "Summer" and "Fresh"! Peel and chop the zucchini. Spray the non-stick frying pan with cooking spray. Add zucchini pieces and cook, stirring occasionally, for 5 minutes, or until tender. Add salt and pepper to taste. Let quinoa and zucchini cool completely. Peel the avocados and cut into pieces. Put in a bowl, squeeze ½ of the lemon over them and mix, so the avocado pieces are completely coated in lemon juice (lemon juice will keep avocado from turning brown). In a cup, put the extra virgin olive oil and the juice from remaining ½ lemon and whisk with fork. Prepare 4 quart-size (32 oz) mason jars. Divide the olive oil and lemon juice dressing between the mason jars and pour on the bottom of the jars. Put the cherry tomatoes in the mason jars. 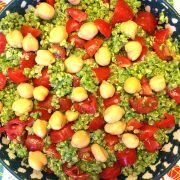 Put the chickpeas on top of cherry tomatoes. Put the quinoa on top of chickpeas. 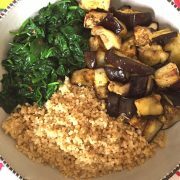 Put the zucchini slices on top of quinoa. Put the green onions on top of zucchini. Fill the remaining space in the mason jars with lettuce leaves. 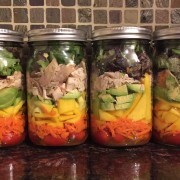 Close the mason jars and refrigerate for up to 4 days. 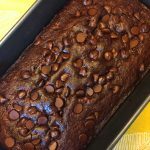 Easy Double Chocolate Banana Bread Recipe – Best Ever!